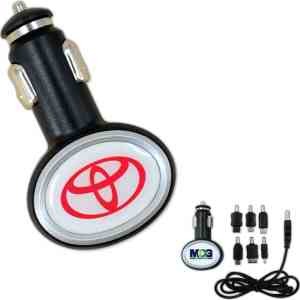 The Brand Charger is a fun and practical promotional product to impress your clients. This device can charge just about any device you can think of: GPS, MP3, phones and much more. The six different adapter plugs make sure the Brand Charger can be used for many products. The charger will plug into an automobile power outlet or cigarette lighter. The bottom of the charger features a dome that will light up any message or logo you wish to include.